Manipur actor R K Somendro known as Kaiku among the Manipuri cinema world, who is contesting the Lok Sabha elections from Inner Manipur parliamentary constituency as an Independent candidate, wants to work as real hero to serve the people of this trouble torn volatile border state. “Let me serve the public as a real life hero the way I play hero’s role in many of my films,” says Kaiku. 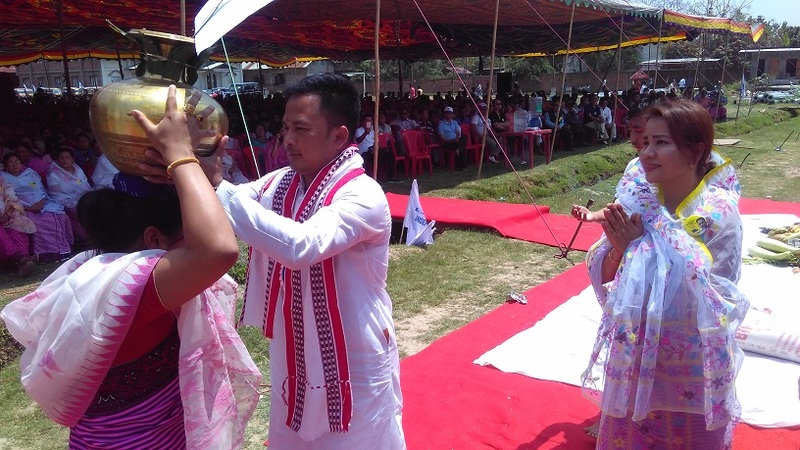 The 40-year-old Manipuri actor who prepared to contest in the Lok Sabha elections since last three years after witnessing people’s grievances during his film career across the State, while speaking at his flag hoisting function at Thangmeiband Athletic Union ground in Imphal recently sought people’s blessing to serve the general public. Nearly 4000 supporters mostly women and youths from different parts of the valley districts of the State turned up to participate in the day’s flag hoisting ceremony which was attended by many film personalities and social workers from different communities. Kaiku who was featured in hundreds of Manipuri music videos since he started his acting journey in the last 15 years, had appeared in more than 300 films.He also acted in many shumang leela, courtyard plays of Manipur. He is a resident of Thangmeiband Meisnam Leikai in Imphal West district. Supporting Kaiku’s move, another popular actor Gokul in Manipuri cinema and music video arena also sought people’s help and cooperation in fulfilling his colleague’s long cherished dream to serve the public. “The recognition and support given by people right from the children to aged persons to our colleague for his continuous dedicated service for so many years will help this time,” says Gokul who is confident of getting more support from youngsters. In a throwback to traditional Manipuri practice, many women folks turned up with head loads of ‘Athenpot’ gifts especially with different kinds of rice, seasonal fruits, flowers and vegetables in steel plates to offer. A similar flag hoisting ceremony of North East India Development Party’s candidate RK Anand who is also contesting in outer Manipur parliamentary constituency, was held at Kwakeithel in Imphal. This time a total of 11 candidates including Kaiku are contesting for the coveted inner Manipur parliamentary seat which was bagged by Congress candidate Dr Th Meinya by beating CPI candidate Dr M Nara in 2014 Lok Sabha polls. The other candidates are Dr R K Ranjan of Bharatiya Janata Party, O Nabakishore of Congress, Dr M Nara CPI, G Tonsana of Manipur Democratic People’s Front, S Nandeshore of Rashtriya Janhit Sangarsh Party, O Jugindro of Manipur People’s Party, M Tomtomsana, W Pobitro Singh, Md Iliyash Khan, all Independents. Polling for the Inner Manipur constituency will be held on April 18.